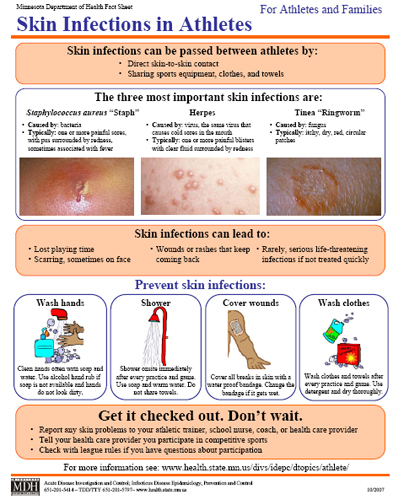 Below is their fact sheet on Skin Infections in Athletes. A printable copy is available by clicking HERE. Clean hands often with soap and water. Use alcohol hand rub if soap is not available and hands do not look dirty. Shower on site immediately after every practice and game. Use soap and warm water. Do not share towels. Cover all breaks in skin with a water proof bandage. Change the bandage if it gets wet. Wash clothes and towels after every practice and game. Use detergent and dry thoroughly. Get it checked out. Don’t wait.